A telecoil, also referred to as a t-coil or telephone coil, is a small copper coil in a hearing aid or cochlear implant (CI). In the presence of other magnetic sources a magnetic field is created which induces an electric current in the coil. When using a hearing device on the t-coil setting, background noise can be mostly eliminated and incoming sounds are directed to the telecoil and are heard louder and more clearly. using an app on a smartphone or iPhone. 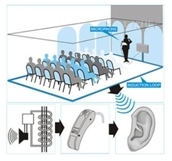 Some telecoils work automatically when a telephone receiver which contains a coil is placed over the hearing aid. Automatic telecoils do not work with couplers or induction loops described below. With the telecoil functioning as a wireless antenna a hearing device can be linked to sound in a variety of ways. Using a coupler to connect to the receiver of a FM, Infrared system or personal communicator which sends signals from transmitters connected to a sound source, a user can hear speech signals over a distance or in a direct one-on-one situation. Couplers mentioned contain copper wiring which also creates an electromagnetic field so that sound is delivered directly to the ear through the hearing aid or CI. Couplers can also connect a person using their telecoil to the TV, radio, MP3 player, or computer. They may connect directly to these sound sources or to an assistive listening device if a person wants to hear over a distance. Perhaps one of the biggest advantages of the telecoil is being able to hear without having to use a coupler and by only having to switch to the telecoil setting in the hearing device. A hearing loop provides this advantage. A hearing loop is a wire, that is connected to a sound system, and that circles a room and creates an electromagnetic field. A person merely turns on the telecoil setting to hear sounds being transmitted. No coupler or external device (receiver) is required. Induction loops can be installed almost anywhere – churches, auditoriums, meeting rooms, airports, buses, subways, in one’s own home, etc. There are also portable loops that can be used at a hotel registration desk, bank teller window, store/restaurant cash register, etc. Portable loops also by-pass the need for headphones or other couplers and transmit the audio signal directly to the telecoil in the hearing aid or CI. If there is difficulty picking up the signal from the loop, the user may want to change the position of the head. This may be necessary due to the position of the telecoil in the hearing device or due to other factors. Hearing devices can be programmed for the telecoil setting (T-setting) only, or for a combination of telecoil and microphone (M/T setting). The M/T setting is beneficial when you want to hear other sounds in the environment such as a person talking to you or the telephone or doorbell ring. This setting isn’t always helpful in an arena where you have both crowd noise and a PA system competing for your attention. You may want to ask your audiologist or hearing health care provider if you can have both settings on your hearing device. A telecoil adds a small amount of cost to a hearing aid but the benefits far outweigh the cost. When you purchase a hearing aid, ask the audiologist or hearing health provider about a telecoil. If you already own hearing aids but do not know if you have a telecoil, go back to your audiologist or hearing health care provider and ask if you have one. If you do have a telecoil but it is not activated, it can be activated for you and your audiologist or hearing health care provider can explain to you how to use it. If you do not have a telecoil, ask your audiologist or hearing health care provider if your hearing aid can be retrofitted with a telecoil. In spite of how small the telecoil in our hearing devices is, it is “mighty” in the power it provides and the ability it has to enhance our listening experiences. It is important that each of us learn about this feature as it can improve our connection to people, help us to maintain independence and add enjoyment to our lives.